Stock status is current as of 4/20/2019 8:47 AMET. Power two SATA drives from a single LP4 power supply connector. 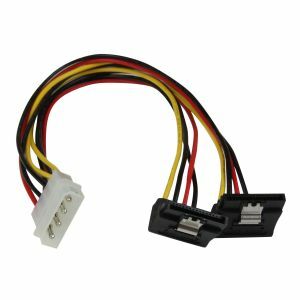 The PYO2LP4LSATR LP4 to Dual Latching Right-Angle SATA power splitter cable features two Serial ATA female power connectors and one LP4 male connector - a reliable solution that enables you to power two SATA drives using a single LP4 connection to the computer power supply.